The bedside terminal solution features many applications that allow patients to feel at home through comfort, familiarity & information provision. Patients are able to access entertainment, telephone and internet services through a simple & intuitive interface leading to improved patient engagement and experience. Patients can also provide feedback about the hospital and their medical status through the built-in survey platform. Services are immediately available at the bedside and are carried over if a patient has been transferred to another room. 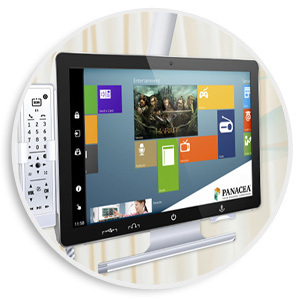 Panacea’s™ patient interface can be customized to add/remove applications as desired by the hospital. Panacea’s™ customizable nature allows for the solution to be deployed in Common Areas within the hospital for patient & visitor entertainment. Within this area, Panacea™ application can include access to Television, Internet & Education and can be deployed on TVs, touch screen monitors & Windows tablets. This offering is optimized for high traffic and/or high turnover areas. If you are interested in an application that is not listed here, please contact us and we would be happy to discuss how we can help meet your requirements.